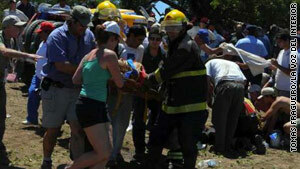 Emergency personnel help spectators who were hurt after a vehicle went off the course during the Dakar Rally. (CNN) -- A woman watching the Dakar Rally in Argentina died Saturday after a vehicle in the event went off the track, striking her and other fans, race organizers said. Sonia Natalia Gallardo died Saturday afternoon at a hospital in Cordoba, Argentina, race organizers said in a statement on the event's Web site. The others who were hit were being treated for "slight injuries," the statement said. The incident, which involved German driver Mirco Schultis and Swiss partner Ulrich Leardi, occurred in the race's first stage, from Buenos Aires to Cordoba, the organizers said. Schultis and Leardi were driving in a 4x4 Desert Warrior truck, according to the Web site. Tomas Fragueiro, a photojournalist with Argentina's La Voz del Interior, witnessed the accident and told CNN that he helped police and medical teams take care of the victims. "I was in the internal zone of the 30-kilometer curve where most reporters were standing," said Fragueiro in a telephone interview. "Security did not include the security tapes required in most races and [Gallardo] was standing outside a safety zone," he said. Race officials offered their condolences to the victim's family and called for organizers and authorities to "exercise the greatest care and keep within special 'spectator zones.' "
Established in 1978, the Dakar race is an intrepid, off-the-beaten-path rally that involves modified vehicles. Known for its strenuous itineraries, the race first took place from Paris, France, to Dakar, Senegal, and later moved to other regions of the world. This year's Dakar race is in South America for the first time. The race spans from Argentina to Chile from January 1 to 17.